Not only have Metabo thought up an entirely new torque control system, but they have come up with a number of attachments and design tweaks to make this drill as versatile as possible. First up they have designed a patent protected torque clutch system, which does away with the usual collar design, instead replacing it with a sliding switch. This actually has the effect of shortening the length of the tool along the drill's main axis, making it easier to use in tight spaces, which is invaluable for home and professional use. The selector for the drill/screwing speeds has toggles on both sides of the tool, and the forward, backward switch works from both sides too. The drill motor is of an unusually high spec. It is a four-pole motor, compared to the usual two. This means smoother running and more power. The drill also benefits from ESCP Machine and Battery Protection. Another fantastic function is the unique Impuls system. This is for removing and tightening difficult screws. Basically, when engaged, the system pulses the drill motor on and off, providing a little extra kick to remove those troubling screws â€“ and believe me, it works.The various attachments that come with the drill make it a very versatile bit of kit as well. There's a right angle attachment, which lets you drill at 90 degrees to the usual drill axis, as well as an attachment to turn the drill into a pair of power shears, and a dust extraction attachment. 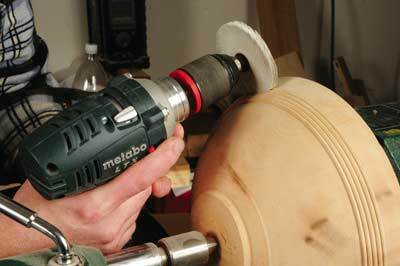 Metabo have left no stone unturned in the quest to make a brilliant drill. The drill comes with 18v Li-ion batteries which provide great performance, and the charger has a fan to cool the battery. Here, the charger and battery design allow for quick cooling, and therefore faster charging. 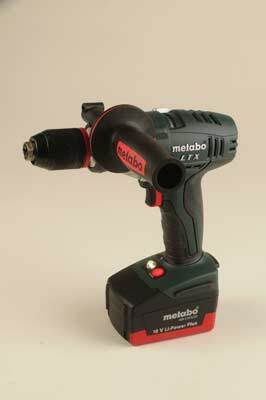 Metabo have made great efforts to produce a great bit of kit, and it shows. The hammer section, although not used when using it for turning, is a boon for various drilling applications. This is a tool for heavy-duty use by hobbyists and professionals and is usable around the home and workshop. It oozes quality, is sturdy and robust, as well as balanced. Being cordless makes life easier when using it for power sanding options.